Following the acquisition of reigning National League MVP, Giancarlo Stanton, the Yankees looked to shed payroll elsewhere on the roster in hopes of staying under MLB’s 2018 luxury-tax threshold of $197 million. Third baseman Chase Headley was subsequently traded to the San Diego Padres, freeing up $13 million. While Headley could not replicate his Gold Glove and Silver Slugger 2013 season as a member of the Yankees, he did start nearly 150 games per year from 2015-2017 and provided an offensive spark versus the Houston Astros in the ALCS including two hits against Astros ace, Dallas Keuchel, in a crucial Game Five win. Fraught with minor league talent and newfound salary cap space, General Manager Brian Cashman can be creative in identifying Headley’s successor. While the Bombers have reportedly remained engaged in trade talks with the Baltimore Orioles regarding superstar, Manny Machado, the following are some potential options to fill the void left at third base if a trade for Machado does not materialize. Maikel Franco of the Philadelphia Phillies appeared on the Baseball Prospectus Top 101 Prospects list for consecutive seasons before his brief debut in 2014. Franco made an immediate impact when given his first significant opportunity in 2015, slugging 15 home runs in just 80 games, to go along with a .280 batting average. However, as the Phillies’ everyday third baseman in 2016 and 2017, Franco regressed at the plate. The 25-year-old’s OPS dropped by 150 points from 2015 to 2017 as his line drive rate fell drastically. While Franco’s lack of progress at the plate has been disappointing, there are several factors that indicate a bounce-back season may be imminent. Consider first that Franco maintained a terrible .230 BABIP in 2017, this is a number that is sure to increase for a player that hits the ball as hard as he does (176 balls in play with exit velocity greater than 95 MPH). Franco also went on a tear at the plate to finish the 2017 season, driving in 14 runs on six homers during the last month. Both signs allude to the potential for 2018 to be the season that Franco finally realizes his star potential. While reports have noted that the Phillies are reluctant to trade Franco with his value at its lowest point (via Jerry Crasnick, ESPN), the Yankees would be a team with the minor league talent to persuade the Phillies to move the right-handed slugger. Franco is not eligible to become a free agent until 2022 and made just $560,000 last season, thus the Yankees have the opportunity to buy-low on this controllable, former top prospect with huge power. Josh Harrison the primary second baseman of the Pittsburgh Pirates, is rumored to be amongst the Yankees’ trade targets this offseason. The two-time All-Star had the best season of his career in 2014 when he finished ninth in MVP voting and amassed a 5.1 WARP, good for 12th in the league. Harrison consistently provides a spark on offense, defense, and on the basepaths for his team. Much of Harrison’s value lies in his versatility; he has played over 250 games at both second and third base as well as more than 100 games in the outfield in his career. Thus, Harrison would remain a valuable player even if the Yankees were to call up prospects during the season, such as Miguel Andujar and Gleyber Torres, to take over second or third base. Adding Harrison will allow the Yankees to promote the players that management feels are ready for the big leagues as opposed to simply promoting players to fill holes. At thirty years old, Harrison has one more year left on his contract at $10.25 million, with club options for 2019 and 2020. The Pirates have expressed a willingness to entertain the idea of trading some of their stars, and a trade for Harrison would provide the Yankees with additional flexibility in subsequent roster moves. Todd Frazier was acquired from the White Sox in July of 2017 to provide corner infield depth after first baseman Greg Bird underwent midseason foot surgery. Frazier was struggling to replicate his 2016 production with the White Sox, batting just .207 before being dealt to the Bombers. As a Yankee, the Toms River New Jersey native improved his OBP by nearly 40 points with modest increases in his batting average and walk rate. Likely motivated by the short porch in right field, Frazier, also improved his ability to drive the away pitch, something that he had struggled with early in the year. The main deterrent of a reunion with Frazier, who will be 32 years old when the season begins, is his desire to sign a multi-year deal. The Toddfather will likely sign a deal similar to the three-year deal worth $37.5 million that another 32-year-old infielder, Daniel Murphy, received in 2016. Barring another payroll clearing move, it will be difficult to sign Frazier at this price and remain under the luxury tax threshold. Thus, despite his positive clubhouse presence and powerful bat, a reunion between Frazier and the Yankees seems unlikely. Brandon Phillips is known for Gold Glove defense at second base. However, after the Braves recalled top prospect Ozzie Albies, Phillips was asked to move to the hot corner for the first time in his career. Phillips excelled when given the opportunity, converting all 45 of his chances into outs. Granted, the sample size of just 25 games was minimal, but Phillips nonetheless proved that he can handle the move across the diamond. Offensively, Phillips is one of just three active players with over 200 career home runs and stolen bases and still possesses moderate power and speed at the age of 36 years old. In addition, Phillips has consistently maintained an extremely low strikeout rate over his career; he struck out on just 12 percent of his plate appearances in 2017. With sluggers in the middle of the Yankees projected lineup, Phillips, and his ability to put the ball in play would fit well at the end of the order. Phillips would certainly be a more affordable option than Frazier. Thus, although he is no longer a prominent run producer, Phillips will help the Yankees accomplish their goal of staying under the luxury tax threshold in hopes of being active with next year’s acclaimed free agent class. Miguel Andujar would be one of the most likely and most affordable options to take over at the hot corner in 2018 and beyond. Andujar excelled at the plate in Double-A and Triple-A before he received a call to the majors in late June of 2017. His debut was a must-watch, highlighted by a two-run double that was crushed off the centerfield wall in Chicago. The trepidation in giving Andujar an everyday opportunity has never been about his offense, however. In his minor league career, Andujar owns a terrible .915 fielding percentage, due in part to his still developing footwork and strong, but inaccurate, arm. Thus, if Cashman and the Yankees do in fact give the opening day job to Andujar, it will be because they believe his defense has improved during the offseason. Gleyber Torres is the seventh-ranked prospect in baseball, according to Baseball Prospectus’ 2017 rankings. In his first year in the system, Torres became the youngest player to ever win Arizona Fall League MVP at just 19 years old. Scouts believe that Gleyber possesses all five tools and has benefited from his quick hands on defense and at the plate. One of the most exciting developments for Torres in 2017, before Tommy John surgery ended his season, was the power that he showed across two levels, slugging seven home runs and 23 total extra-base hits in just 55 games. On defense, Torres is most experienced at shortstop, but the Venezuelan infielder is a great athlete and can play multiple positions such as second and third base. It is only a matter of time before Yankee fans see Torres in the Bronx; some in the organization were reportedly inclined to make the super prospect the opening day shortstop last season with Didi Gregorius injured. One factor, however, that could delay Torres’ ascent to the majors would be the front office’s desire to delay his free agency. If Torres were to spend the first few weeks of the season in Triple-A, the Bombers would push back his free agency by one year. 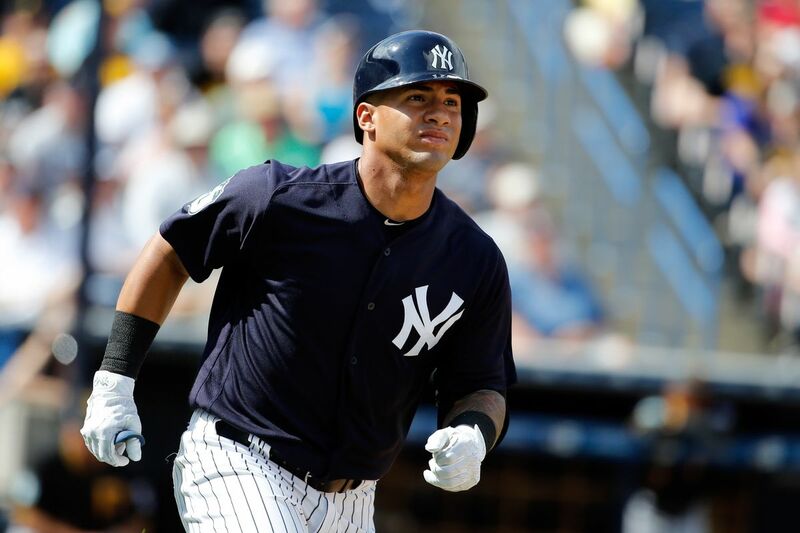 Delaying such a special prospect’s free agency would likely be a wise move by the Yankees, however, Torres may be able to convince them to do otherwise during spring training with his potent bat and versatile defense. General manager Brian Cashman recently suggested that he is prepared to use internal options to fill the remaining holes in the Yankee infield. One can assume, however, that Cashman will continue to explore the trade and free agent market to provide some insurance for his inexperienced players. The top of the Yankees projected batting order resembles that of an All-Star team, giving them the unique opportunity to install at third base a combination of exciting prospects and reliable veterans in 2018.